Just a few days ago – September 8, 2014 – was the 350th anniversary of the founding of New York. 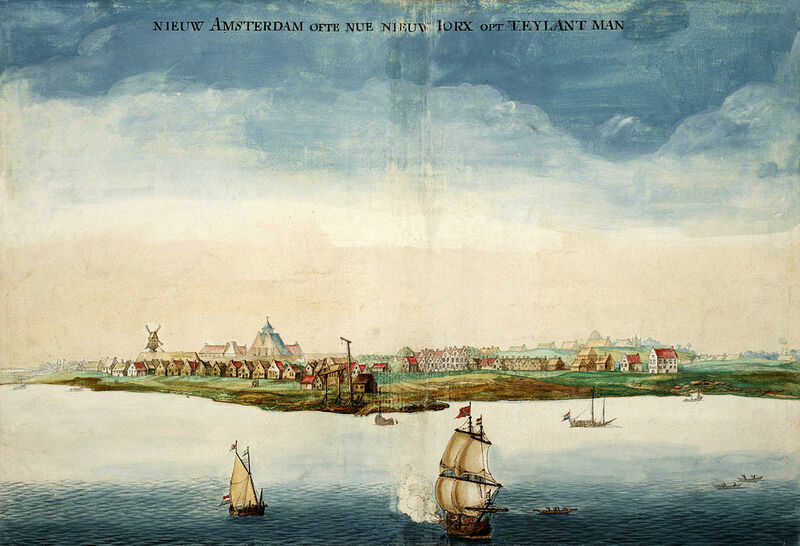 New Amsterdam as it appeared circa 1660. Painting from Wikipedia. Originally a Dutch settlement called New Amsterdam, the town decided to give up without a fight in the face of an overwhelming English expedition commanded by Colonel Richard Nicholls consisting of four warships, including Nicholls’ flagship: the frigate Guinea. James, the Duke of York, with the permission of his brother King Charles II, decided to send the flotilla to take possession of the Dutch holdings in North America. At the time the two nations were jockeying for the title of most powerful naval force in the world. In fact, this event would touch off a larger war between them. 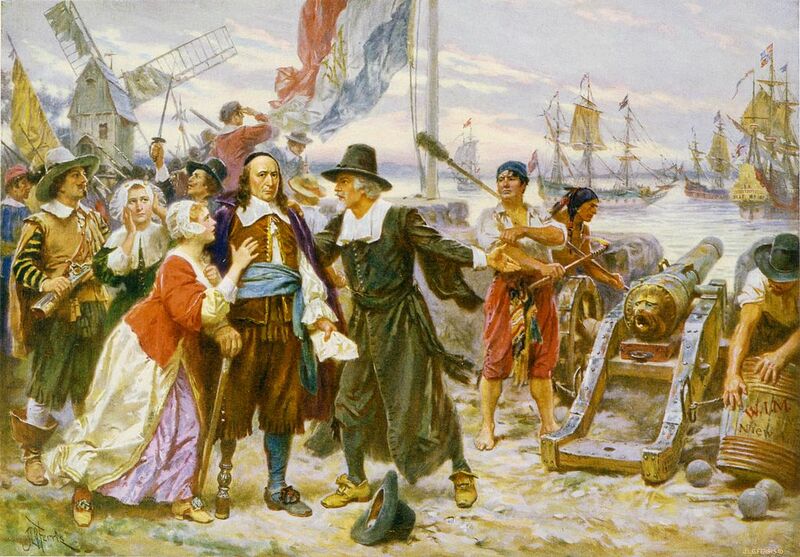 Governor Peter Stuyvesant is persuaded not to resist the English. Painting from Wikipedia. Once the settlement was taken, it was re-named New York at Colonel Nicholls’ suggestion in honor of the Duke himself. Apart from being one of the pivotal moments in the colonial period, the creation of New York also means quite a bit to the Skillmans: it is the event that brought the first member of our family to the western hemisphere. His name was Thomas Skillman. The stories about him are varied and at times somewhat sketchy, but I’d like to explore them a little bit here. Born in Surrey, England in 1637, at some point he joined the army in time to participate in the 1664 expedition to North America. The traditional family story (backed up by most sources) is that he was serving as a musician, but I’ve also seen him referred to as “Doctor”, implying that he was a surgeon or physician instead, but I don’t find this likely. Soon after the conquest, Colonel Nicholls became Governor Nicholls. Thomas must have felt some kind of connection or loyalty to Nicholls, because he did not return to England with the rest of the troops, instead choosing to settle on Long Island in a village called Newtown, which was in the area that is now known as the Elmhurst and Maspeth neighborhoods in Queens. His military service continued, as he was one of 25 men sent to Esopus, NY to seek revenge against a group of Native Americans who had attacked a colonial settlement in the Hudson River Valley. Though he was offered a plot of land in that part of New York for his service, he seems to have refused it, and was discharged in 1668, even being awarded “14 oz. of plate for services at Albany under Captain Lewis.” No one seems to have any idea about what he did to earn this distinction. Returning to Long Island, he married Sarah Pettit in 1669. Sarah was born in Boston, probably in 1634. There is some debate about who her father was, but it seems likely that he was Thomas Pettit, an early Huguenot immigrant to the Massachusetts colony. Regardless, the couple settled in Newtown and lived there the rest of their lives, and sadly we don’t know much more about their life – other than the fact that they had at least 4 children. Thomas probably died in 1697. His property was left to his wife, who transferred a portion of it to their only son, Thomas Skillman (II). So far as we know, all the American Skillmans – three and a half centuries worth of them – are descended from these two men.